Lidl Ross on Wye – Have your say! 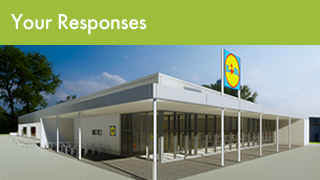 Lidl is seeking to deliver a new food store at Wolf Business Park, Ross on Wye HR9 5NB. The proposed development will demolish the some of the existing buildings on the site to allow for the new Lidl food store with associated car parking, servicing and landscaping. Alongside this a bespoke employment area to the south of the site which will provide enhanced accommodation for small-scale business uses that will offer bespoke and flexible units to local businesses which will be retained by the Wolf family. As part of our due diligence we are consulting local residents to establish your views on our proposed development. Please get in touch via the Contact Us page to let us know your views in more detail, and ask any questions. Do you support the wider vision for the Wolf Business Park to redevelop the site and deliver bespoke employment units alongside a new Lidl neighbourhood food store? Do you think a new Lidl supermarket would be a benefit to the area? Do you think there is a sufficient choice of supermarkets within the local area? Click ‘YES’ to register your vote before answering Question 4. Click ‘NO’ to register your vote before answering Question 4. Click ‘UNDECIDED’ to register your vote before answering Question 4. Do you currently do your supermarket shopping in Ross on Wye? Click ‘YES’ to register your vote before answering Question 5. Click ‘NO’ to register your vote before answering Question 5. Do you think the provision of new and enhanced business premises would be beneficial to the local economy of Ross-on-Wye? Click ‘NO’ to register your vote. Click ‘UNDECIDED’ to register your vote. Your data will not be used for any other purpose. Please encourage friends, neighbours and family members (over the age of 18 and living within Ross on Wye or surrounding areas) to complete the questionnaire.